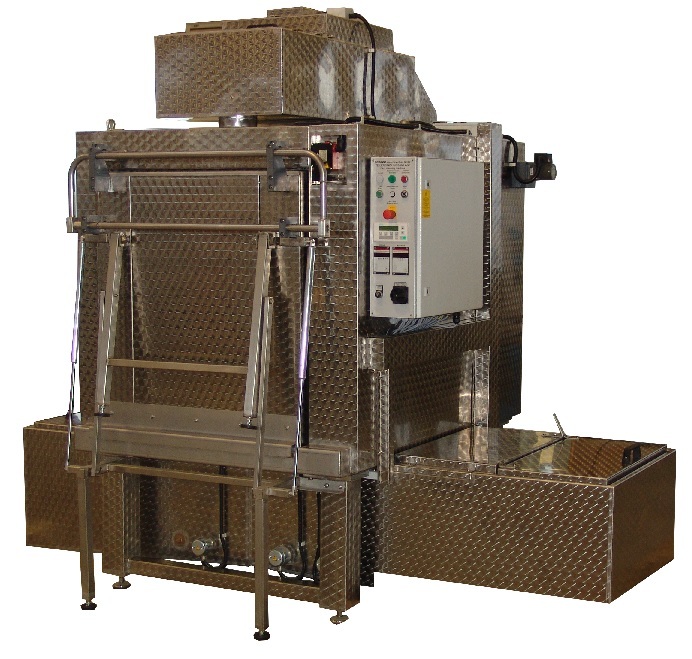 Our Frontloading machines, also named one chamber cleaning machines, are solid machines made from stainless steel that clean with spraying technology. In this type of machine, the parts rest inside the fix washing basket while a motorized, circumferential nozzle system moves along the washing basket. For an excellent cleaning result, the lateral nozzles are always aligned in the direction of the movement. The nozzle system in stainless steel is supplied by two powerful pumps made from stainless steel. To minimize the costs for heating and energy, our frontloaders are completely insulated. The circulating medium is filtered entirely in the backflow by a filter box made from stainless steel. Furthermore, these machines are equipped with powerful pumps made from stainless steel, a programmable controller and a digital temperature indicator. A protection from dry-running protects the pumps and the heater. The integrated leakage monitoring system shuts down the machine in the case of a leakage. In our Frontloading machines, the parts rest in the fix washing basket while the circumferential nozzle system moves along the washing basket. The pumps with pump heads in stainless steel bring the medium from the insulated tank to the motorized nozzle system. The nozzles of the nozzle system are always aligned in the direction of the movement and rest during a while in each end position to optimize the cleaning result. The medium circulates inside the machine and passes through a full flow filtration. The filter basket can be taken out easily for cleaning purpose. The temperature is indicated digitally and is steplessly variable. The frontloaders are equipped with a programmable controller with a control panel, a digital temperature controller and a fault indication. 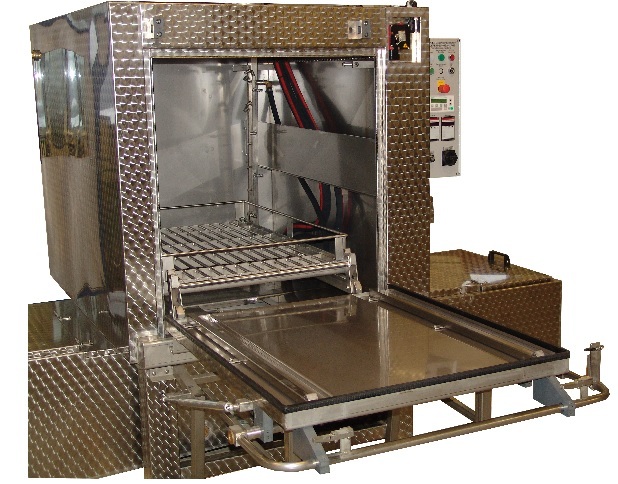 Our frontloading machines in the solvent version are not insulated and not heated. Beyond these, this version is identic to the heated frontloading machines . They are equipped with full-flow filtration, stainless stell pumps and a SPS-controller. They dispose of the Parts Clean Control, too, that indicates the actual temperature. You will find further information in the Standard equipment. The temperature is indicated digitally. The frontloaders are equipped with a programmable controller with a control panel and a fault indication. Our frontloading machines with 2 tanks are based on the standard Frontloaders. Construction and equipment correspond to the one-tank machine, but a second process (rinsing) has been integrated into the system. The medium circulates and is filtered in full-flow. The seesaw system brings each medium back into it's tank. Both tanks are fully insulated and heated. The washing and the rinsing process are programmable at the controller. The temperature is indicated digitally. In the frontloading machine FL 2-tanks, both processes washing and rinsing are carried out by spraying. 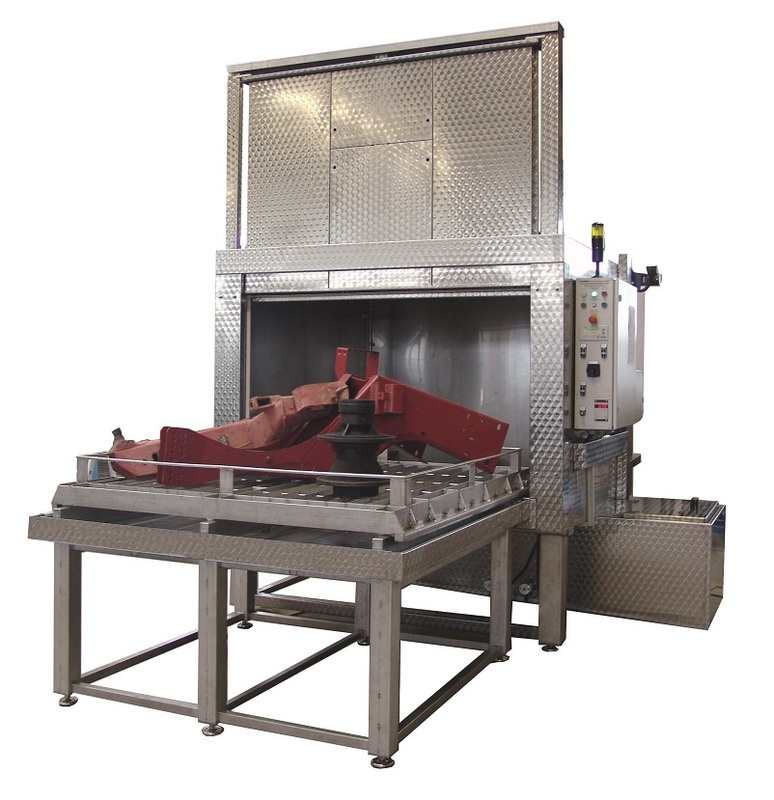 Two separate nozzle systems in stainless steel are supplied from the respectif insulated and heated medium tank. The parts lay in the washing basket while the circumferential, motorized nozzle system moves along the washing basket. In the machines with 2 tanks, an integrated seesaw-system brings each medium back into the respective tank. Both medium circulate in the machine. A level control system protects the pomps and the heaters in each tank from dry-running. The machine is standardly equipped with a fold door, that serves as platform for loading and unloading. A lift door is optionally available. Digital temperature indication "Parts Clean Control"